Empress of Palmyra; regent (from 267 to 273) for her minor son Vollabathus, who had been appointed imperator by the emperor Aurelian. 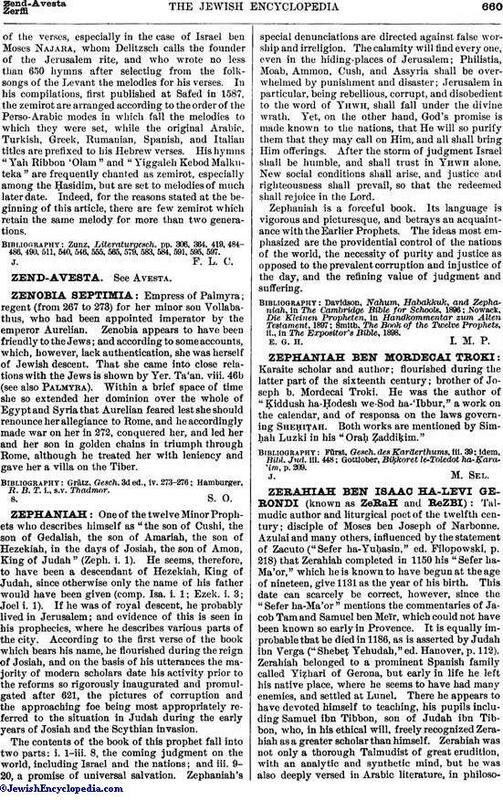 Zenobia appears to have been friendly to the Jews; and according to some accounts, which, however, lack authentication, she was herself of Jewish descent. That she came into close relations with the Jews is shown by Yer. Ta'an. viii. 46b (see also Palmyra). Within a brief space of time she so extended her dominion over the whole of Egypt and Syria that Aurelian feared lest she should renounce her allegiance to Rome, and he accordingly made war on her in 272, conquered her, and led her and her son in golden chains in triumph through Rome, although he treated her with leniency and gave her a villa on the Tiber. Hamburger, R. B. T. i., s.v. Thadmor.